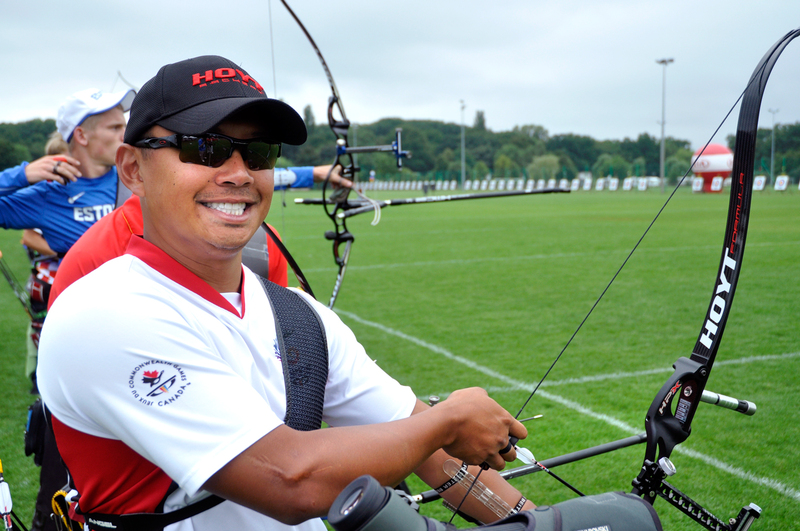 On the eve of the final World Cup stage of the year in Wroclaw, Crispin Duenas of Canada took some time out from official practice to answer my questions. Thanks Crispin! So, we’re almost on the start line in Wroclaw, you have a chance of making the grand final… how are you feeling? I’m feeling confident that I can still make it to the final. I have made it to the medal matches in world competition before so this is no different than any of those previous situations. What does official practice day for a World Cup event look like for you? It just consists of getting used to where my target is, making sure that all of my equipment is good to go, meeting my target-mates and finding out what colour nocks they are shooting; I don’t want to have any confusion with arrows that have the same fletching and nock colour in the target. What is the most satisfying part of the sport to get right? The most satisfying thing is consistently executing a nice relaxed but strong shot. When everything is relaxed, my arrows never miss the centre of the target. I think the proper steps to raising archery’s profile are already being taken. 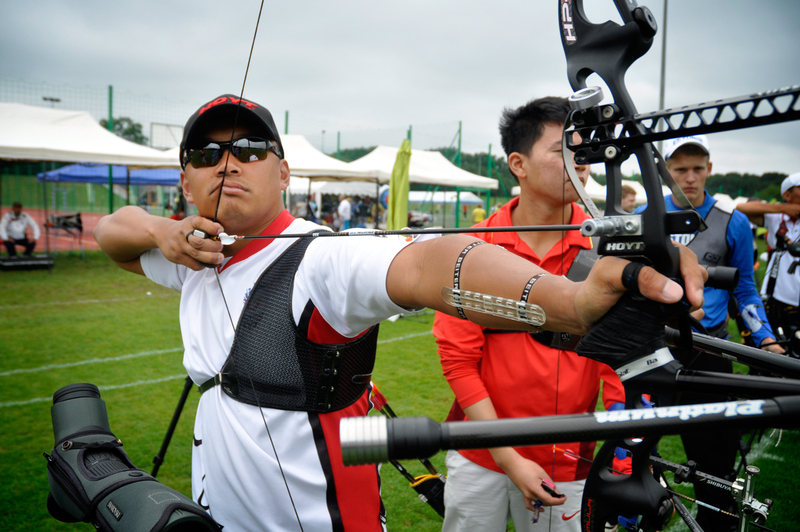 Aside from the movies in Hollywood, World Archery has made the viewing of World Cups and World Championships extremely easy for anyone with a computer. Our eliminations are easy for anyone to understand, as well. Can you give us a practical archery tip that you follow yourself? There’s a time for experimenting and a time for performance. Know when you’re supposed to do each and stick to your plan. Always keep a calm head. Temper tantrums really get you nowhere on the archery field. What sacrifices have you made for archery? The biggest sacrifice I’ve made for archery is the amount of time I spend at home. I don’t get to see my family all the often, and usually there will be family events where I can’t go because I’m away at a tournament or training. I deal with frustration by just reminding myself that archery is a game of precision and being frustrated or tense will not help my shooting. It’s just better to stay calm and relaxed when things aren’t going my way. I believe there is some extent of luck on the shooting field. A great example of this is in set play; an archer with a lower overall raw score can still win a match in terms of set points. What’s your earliest memory of archery? My earliest memory of someone shooting a bow was from when I watched Robin Hood on TV. Other than that, I really didn’t see real archers until I started archery lessons at the age of 13. What’s your favourite sport apart from archery and why? My favourite sport outside of archery (that I practice) is road biking. For me it’s a great workout, but it’s peaceful when I’m cycling alone and just keeping my pace up. On the other hand, I love watching all the sports during the Olympics, both summer and winter. Seeing athletes push themselves to be the best motivates me to be better. You’re a musician, aren’t you? Tell me about that. Well I wouldn’t really call myself a musician. I do, however, like playing my instruments in my spare time. The two that I mainly play now are the guitar and piano. I also play the flute, trumpet, and drums. It’s pretty much another form of relaxation for me. The last three tracks I listened to were “Chasing the Sun” by Sara Bareilles, “Hall of Fame” by The Script, and “Kings and Queens” by Thirty Seconds to Mars. I can cook several different dishes (my girlfriend loves it when I cook omelettes, so she tells me 😉 ) but I think the best food I cook is steaks on a charcoal BBQ. My parents really trust my cooking of a steak and will always hand that duty off to me. Follow Crispin on Twitter here. It is fun listening to him as a commentator during the match but more fun seeing him on the shooting line.